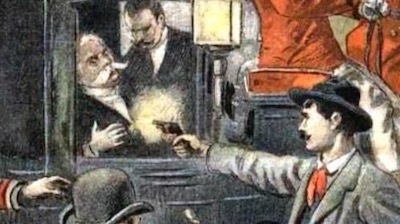 The documentary film tells about life and death of Gaetano Bresci, the Italian anarchist who came back from USA to Italy to kill king Umberto I, on July 29 1900, shooting him three revolver shots in Monza. 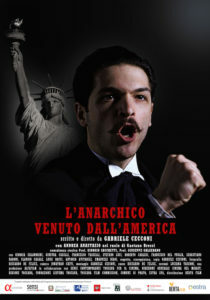 The film focuses on the main stages of Bresci’s private and political life. Why had he emigrated and what were the reasons for his act that led him to abandon his wife Sophie and his daughter Madeleine? And which were the causes of his death? Did he commit suicide as the official version maintains, or did he “get suicided” as all the historians and journalists who took care of the case believe now? The documentary film tells in a rigorous way the events that led young Bresci to emigrate to Paterson (New Jersey), and then to return to Italy to kill the king, through fiction scenes, interviews with historians and university teachers, original video materials. Up to now there are no documentary or fiction films on Gaetano Bresci. There have been several television and film projects, but they have not been realized because of the historical removal of the regicide, a “​damnatio memoriae​” that still lasts and that is completely anti-historical. Bresci’s act caused a sensation at the time and then people tried to hide it and forget it. Our intention is not to exalt or condemn , but to understand and to relate, in the most objective way, his public and private life, his anarchic formation and his loves. They are very interesting from the historical and cinematic point of view. Gaetano Bresci, any way we judge him, does not deserve to fall into the oblivion of history. Eppure, quando guardo il cielo ​(2010) all based on historical events relating to the Resistance and deportation to concentration camps. He has recently written and directed five short films dedicated to the ten commandments: ​Non desiderare la roba d’altri (2010); ​Non uccidere (2011); ​Non rubare (2011)​; Ricordati di santificare le feste (2012); ​Io sono il Signore Dio tuo (​ 2013). In 2013 he wrote and directed his first feature film, ​Il seminarista (The Seminarian). Was classified an experimental film by MIBACT (the Ministry for Culture), won the “Emidio Greco” judges prize at the Gallio Film Festival in 2014 and was selected for numerous foreign and Italian film awards, including: Sudfestival 2014, A.I.F.I.C. (American Initiative For Italian Culture) Washington 2014, Religion Today Film Festival, (Trento 2014), UMIFF (University of Miami Italian Film Festival) (2015), FAU (Florida Atlantic University New Italian Director) (2015). The ​Alfafilm company, which has been producing and distributing short, mid-length and full-length films since 2009, was started by Gabriele Cecconi with the purpose of producing independent quality films. Berta Film is an international film distribution company with a strong focus in documentaries. As international sales agent and executive producer we carefully select quality titles, promote their value and bring them to as wide an audience as possible. Our films have been selected by leading international ​festivals such as Cannes Film Festival, Academy Awards, Hot Docs, Idfa, Sheffield, Visions Du Réel, Festival del Film Locarno, Mostra Internazionale del Cinema di Venezia, Torino Film Festival, São Paulo International Film Festival, Biografilm Festival and Festival dei Popoli. With an average of 15 new completed films and series every year and 5 projects in development, Berta Film has represented ​more than 90 titles in the last 5 years and sells its films to ​more than 60 buyers​ around the world. Since 2012 we’ve been attending the ​main markets and pitching forums around the world, such as Mipcom, IDFA, Cannes, Hotdocs, Berlinale, CPH:DOX, Thessaloniki, Leipzig Dok, Visions du Reel, MIA, Locarno, Visioni dal Mondo, Bio To B (Biografilm), DIG Awards and Italian Doc Screenings. Berta Film also acts as executive producer on a limited number of projects every year and provides advisory services​, in particular in business development, consultation, domestic theatrical distribution, domestic and foreign sales.